Invisible Children, a media-based nonprofit dedicated to ending Africa’s longest-running war, will screen its latest documentary, ‘Tony,’ on Thursday, Nov. 3, at 6:30 p.m. in Watson Theater. Following the 50-minute documentary, Grace, a native of Uganda and an ambassador for Invisible Children, will talk about her life growing up in that war-torn region of Africa, and will then take questions from the audience. CART (live captioning) will be provided. A reception will follow the screening and Q-and-A, and representatives from Invisible Children will be on site to talk about current projects and volunteer opportunities, and will sell Invisible Children merchandise. One hundred percent of the proceeds go toward ending the war and rebuilding areas affected by conflict. This event is free and open to the public, and is sponsored by the Syracuse University School of Education and the Regional Holocaust and Genocide Education Initiative. 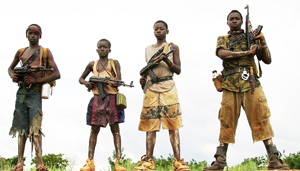 Invisible Children raises awareness about the 25-year-long war in Central Africa, which has been sustained by a rebel group called the Lord’s Resistance Army (LRA), best known for its practice of abducting children and forcing them to serve as soldiers. The film documents the life of a young Ugandan, Tony, and follows the past eight years of his life, which have been marked by violence from rebel groups like the LRA. This event is a part of Invisible Children’s Frontline Tour, where 16 teams are traveling across North America in vans to show films, like “Tony,” alongside Ugandan counterparts who share their similar personal stories of war and survival. The crisis in Central Africa has become the catalyst of the Invisible Children movement, which is focused on mobilizing hundreds of thousands of young people into active participation in foreign affairs. The outcome has been the momentum behind the LRA Disarmament and Northern Uganda Recovery Act that was signed into law last year by President Barack Obama, and the recent announcement of U.S. troops to be deployed to Central Africa to act in an advisory capacity to local forces. For more information about the Nov. 3 screening, call the School of Education at 315-443-4696.